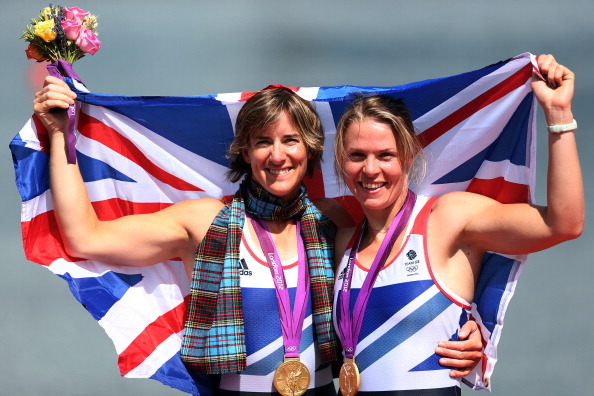 Katherine Grainger's quest for Olympic glory is complete after she won a gold medal with Anna Watkins in the women's Double Sculls. The Great Britain crew dominated the field at Eton Dorney to add an Olympic crown to the two world titles they have won in two unbeaten years. Grainger and Watkins led from the start and were roared on to a commanding victory, beating Australia by a length, with Poland taking a distant bronze. Grainger punched the air as her boat crossed the line. She fell into an embrace with Watkins and acknowledged the 30,000-strong crowd after finally tasting victory at an Olympics. Grainger had been Britain's first female Olympic Rowing medallist, at Sydney in 2000. Four years ago she became the first British female athlete to win medals at three successive Olympic Games. Those medals were all silver and Grainger was distraught at missing out on gold in Beijing, even considering retirement. But the lure of winning in London drove her on. Grainger and Watkins, a bronze medallist from Beijing 2008, stormed to victory, as they have done for most of the last two years. After coming together in 2010, Grainger and Watkins have now won 23 consecutive races. But none of them were as emotional as this with Grainger finally receiving the gold medal she craved. She said, after embracing Steve Redgrave: 'Worth the wait. Steve promised me they'd be tears of joy this time, which they are.